How can JML make your life easier? Offering a huge variety of kitchen, fitness and cleaning gadgets (alongside much more!) JML creates products to make home life easier, essential for the busy family household. Whether for a personal purchase or to buy for a gift there is an item for everyone. We have picked our top five products that you may have never seen before and soon won’t want to be without! So, why not make use of JML’s free delivery and money back guarantee. New Year New you? – Achievable fitness. The Flex Core: Ab Workout and Exercise Machine RRP £69.99. The Flex Core is a portable fitness aid for the home that promotes the repetition of simple body firming exercises with the elements of weight, resistance and support for safe, controlled workouts. The kit is robust and offers three strength settings to sculpt and tone your upper and lower body so can be used by any age range. It is simple to use, the padding is thick and base wipe cleanable. You can set it up in your bedroom or lounge and store it away easily for convenience and space saving. 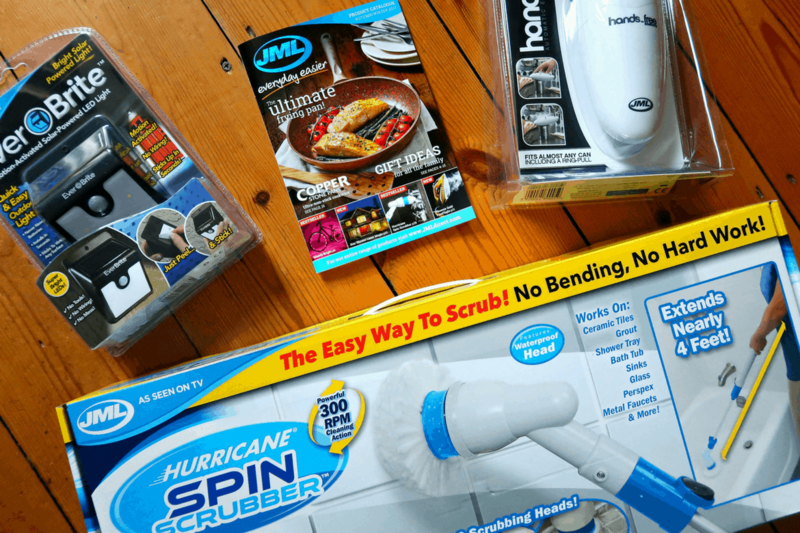 What are the benefits from buying from JML? You’ll receive an easy-to-follow exercise guide in the form of a wall chart to follow for guidance and a fat-burning, muscle sculpting exercise DVD with step-by-step instructional exercise routines. Like most parents time and budget are tight so gym memberships often go unused. Exercising at home when you can grab a free twenty minutes here and there is a much more achievable expectation! Hands free can opener RRP £14.99. The automatic battery operated tin opener means that by a touch of a button you can remove tin lids without leaving sharp edges or spillage. It is a product of convenience. In the last year I have bought five manual openers that tend to dull and mean I am left with lids half on which I have to pull at, neither safe nor hygienic! The ergonomic handle means it is comfortable, it’s lightweight and easy to clean and to store. The metal is magnetised so lids can be easily disposed. It’s in the eating! – Do you want a healthier lifestyle? The Halowave Aircooker is a worktop appliance that combines fan-assisted halogen heat technology with a built-in rotisserie which cooks up to 46% quicker than a conventional oven. Thanks to the super-effective cookware you do not need to preheat food, add little or no oil you can roast, grill, bake, fry, even slow-cook! This little Aircooker can even manage a whole joint with all the trimmings. You will receive an air cooker cookbook, rotisserie spindle and forks, frying basket, tongs, basket and hook stand and rack. Forget ovens that need pre-heating and cook slowly, time is not a friend to parents of children with hungry tummies. The easy-to-use digital controls let you set the cooking time and temperature so you don’t burn food when distracted by Batman. There’s even a digital delay timer so slow-cooked casseroles and stews are ready to eat when you get home from the school run. Keeping the house clean – whilst saving your knees! The Hurricane Spin Scrubber – £39.99. With three interchangeable heads, spinning at 300rpm, this multiuse power cleaner is perfect not just in bathrooms but in the garden. I found it ideal for use in the shower cubicle and hard to reach areas. Replacement heads are available to increase the longevity of the product. Included you will receive an AC adapter, flat brush, multipurpose brush, corner brush and a storage bag. Feeling left in the dark? – combat the Winter nights. The Ever Brite security light RRP £19.99. The Ever Brite’s lithium-ion battery results in a solar-charged security light, even in low light weather conditions. Perfect for lighting paths, garages and gardens motion sensors detects your approach 12 ft away. You also don’t have the hassle of having to remember to switch it on or off and worry about it sucking up electricity. I like that as soon as dusk falls it provides a low-level standby light and LED’s are triggered when you are close, this way you are not overly glared! Installing permanent lighting is a hassle, with the Ever Brite you just have to peel and stick- it is adhesive to a variety or surfaces and doesn’t require screws or drills. It’s useful for in the home, i.e. dark under stairs cupboards! Each of these products has saved our family time or money and generally made life easier, are there any gadgets and gizmo that you cannot live without?